Should You Buy Slabbed Coins? When is the Time to Sell Bullion? Knowing When to Sell; And What's with Slabbed Coins? Linda asks: When is the right time to sell my gold and silver and how do I go about it? 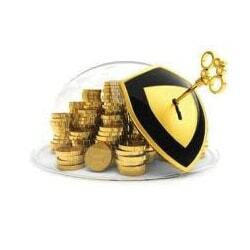 Putting aside life circumstances where you may need to unload your gold and silver, it will not be a good time to sell until alternatives for holding and growing wealth are favorable. Right now, we think investors should prioritize preservation of capital. Choosing the right safe-haven asset for what promises to be volatile times also means positioning yourself for profits as other investors flock to safety behind you. If another asset appears better positioned to deliver capital preservation or if the risks to capital fade, it will be time to sell some of your physical gold and silver. For now, the risks are extreme and most other options are unattractive. The traditional safe-haven alternatives to precious metals are cash and bonds – particularly U.S. Treasuries. But government and central bank policy makes holding these paper instruments quite dangerous. Today, the U.S. government carries more than $100 trillion in combined debt and entitlement obligations. As if that isn't bad enough, the politicians are still racking up massive deficits and launching expensive new programs – such as national healthcare. Officials have clearly signaled their preferences when it comes to dealing with these obligations: devalue the dollar and suppress interest rates. We live in an inflationary system. Until that changes, investors should avoid holding a large amount of U.S. dollars or, even worse, fixed-rate debt. Now is the time to favor bullion and other tangible assets instead. Positive Real Interest Rates. Negative real (below inflation) interest rates destroy savings. Three-month T-bills currently offer 0.03% -- essentially zero! That makes the real interest rate substantially negative, even using the government's politically manipulated CPI figure. T-bills and other interest-bearing vehicles won't be an attractive alternative to physical gold until their real yields turn positive. An end to permanent deficit spending. Our government has been consistently spending more than it collects in taxes for decades. With every dollar borrowed comes additional incentive to stay the course on dollar devaluation, the preferred long-term strategy for dealing with suffocating debt repayment and overwhelming entitlement obligations. A Dow:gold ratio of 3 or less. At the climax of the last bull market in gold, one ounce of gold could buy one theoretical share of the Dow Jones Industrials. Right now, it would take 13 ounces of gold. As the precious metals bull market resumes, history tells us that gold (and silver) will outperform the general stock market by many multiples. Of course, everyone must assess the situation for themselves, taking into account their own personal circumstances. Money Metals Exchange is available to purchase your precious metals when you make a simple phone call. If you decide the time is right to sell your bullion, just give us a call at 1-800-800-1865. For more details, see our step-by-step guide: How to Sell. Are Slabbed Coins Worth the Money? Edward asks: I'm interested in buying a 1 oz Gold Buffalo. Is it better to buy slabbed or raw? Unless you are an experienced coin collector who has a good handle on what the coin is actually worth (not relying on the salesperson's assurances about its supposed value) we advise you stay well away from “slabbed” (graded) collectible coins for sale of all types. While Money Metals Exchange will buy these coins from customers and pay a fair price, our staff members hear lots of unhappy stories. These plastic-encased coins had almost always been purchased for much higher prices than prudence would dictate. 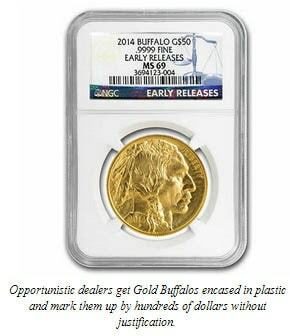 So-called “modern rarities” such as graded American Buffalo gold coins are not rare at all. Exploitative dealers buy newly minted coins from the U.S. Mint and send them to a grading service. For about $25 per coin, the service bestows a mint state (MS) score and places the coin in a plastic “slab” with an official certification of its condition. You can look more into other old gold coins, especially those not slabbed if you want to pay lower premiums. These coins may not be considered the most popular gold coins out there, but you can't beat the price to obtain them. These coins are then sold to hapless investors at prices which are often hundreds of dollars higher than the melt value of gold. The buyer gets the bad news later, when it's time to re-sell the coin. Despite the salesperson's assurances and the fancy plastic holder, the coins don't fetch much, if any, higher premium than a regular – or as you wrote, “raw” – bullion coin. What is a Raw Coin? A raw coin, is a coin that has not been graded by a major grading service. It can still be in a plastic holding case, however it won't have the grading from a third party like a slabbed coin. If you do it right, you'll invest in a standard bullion gold Buffalo coin at a price near the melt value, plus a small premium. And you should be able to sell it back to the dealer for more than the spot price. For example, Money Metals currently sells these coins at about 6% over spot and pays roughly a 2% premium when purchasing from customers. These questions were answered by Clint Siegner and Stefan Gleason.